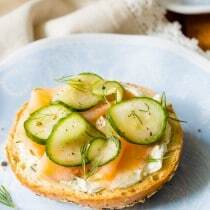 Quick Pickles Smoked Trout Herbed Cream Cheese Bagels – A vibrant twist on Bagels and Lox, incorporating freshly-made quick pickles, garlic dill herbed cream cheese, smoked trout, and crispy everything bagels. Quick Pickles with Smoked Trout on Herbed Cream Cheese Bagels… Whew! 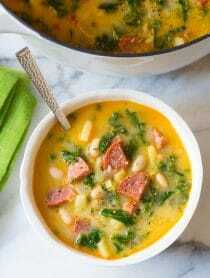 I realize that is an absurdly long recipe title, but it just didn’t feel right to leave anything out. Every element of this simple toasted bagel stack is a thing of beauty, and needs to be celebrated equally. Herbs are starting to pop up in my container garden. Dill is always among the first round of herbs to arrive. Its’s a light fragrant herb, perfect for spring dishes. Dill is suitable to use with delicate ingredients, yet can hold its own against stronger flavors… like homemade quick pickles and smoked trout. Today I used fresh dill in an herbed cream cheese with garlic and lemon zest, to spread on toasted Thomas’ Everything Bagels. Thomas’ bagels are known for their soft bubbly interior and chewy exterior. 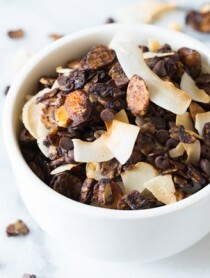 A combination that provides a perfect crunch when toasted. Nothing compares to the zingy quality of homemade herbed cream cheese over a hot crispy bagel. The vibrant herb flavors complement the seeded golden crust on the bagels, and the textures and temperatures provide a creamy-crisp hot-cold sensation that is hard to beat. After spreading each bagel with ample amounts of cream cheese, I topped them with thinly sliced smoked trout, and easy homemade quick pickles. Quick pickles are light, perky, and take almost no time to make. Simply place thin cucumber rounds in a warm briny pickling liquid, and a few minutes later you have magic. 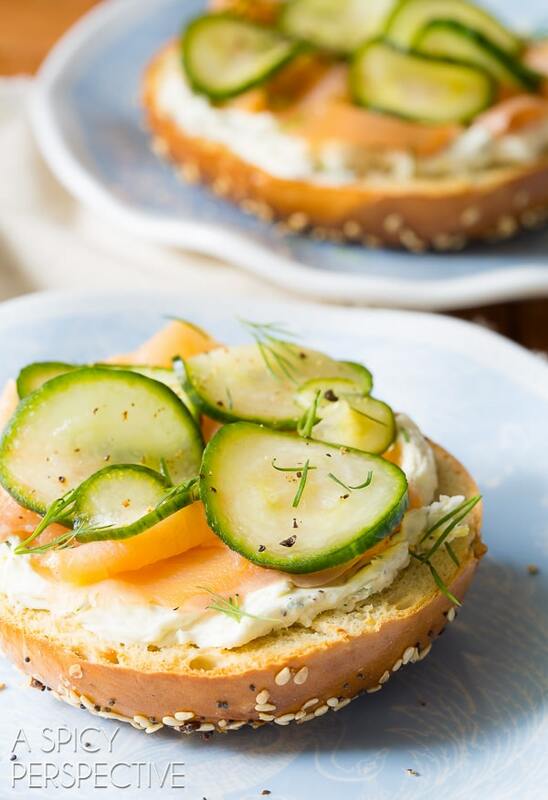 Quick Pickles Smoked Trout Herbed Cream Cheese Bagels are an elegant, yet comforting, dish for a spring breakfast, brunch, or lunch. With fresh flavors, and crispy Thomas’ bagels, this “bagels and lox” variation will truly give you something to celebrate! 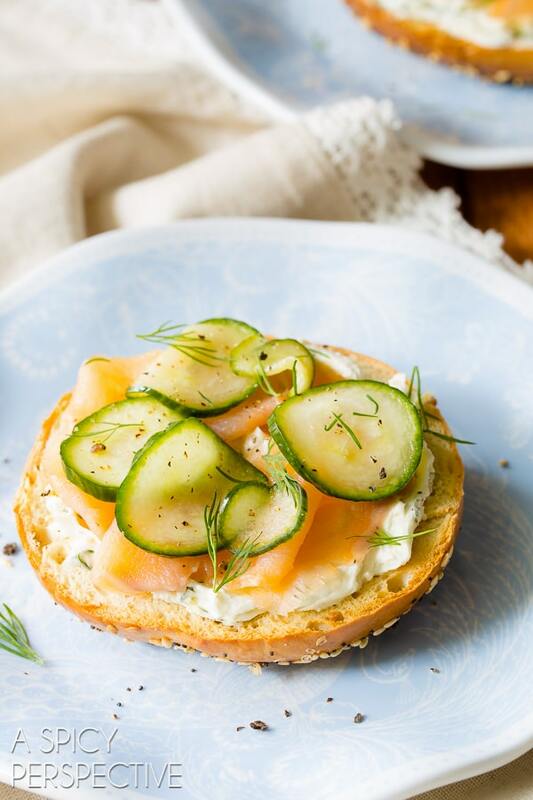 Fresh and Zesty Quick Pickles Smoked Trout Herbed Cream Cheese Bagels – A fabulous breakfast, brunch, or lunch option with homemade pickles. 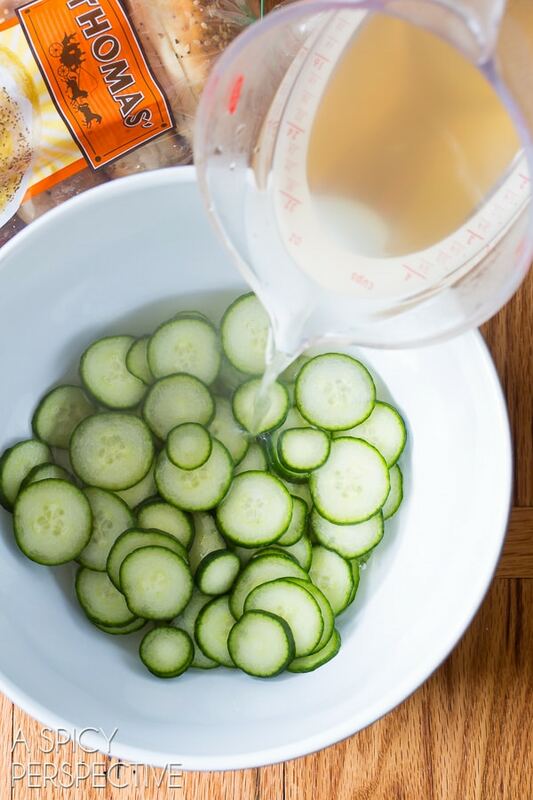 For the Quick Pickles: Pour the water and sugar in a large microwave-safe bowl. Microwave on high until the water comes to a boil, usually 3 minutes. Stir to dissolve the sugar; then add the vinegar and salt. Slice the cucumber very thin and stir the slices into the pickling liquid. Set aside for as long as possible. For the Herbed Cream Cheese: Place the cream cheese, garlic, dill, and lemon zest in a mixing bowl. Smash and stir until well combined. Salt and pepper to taste. Set aside. 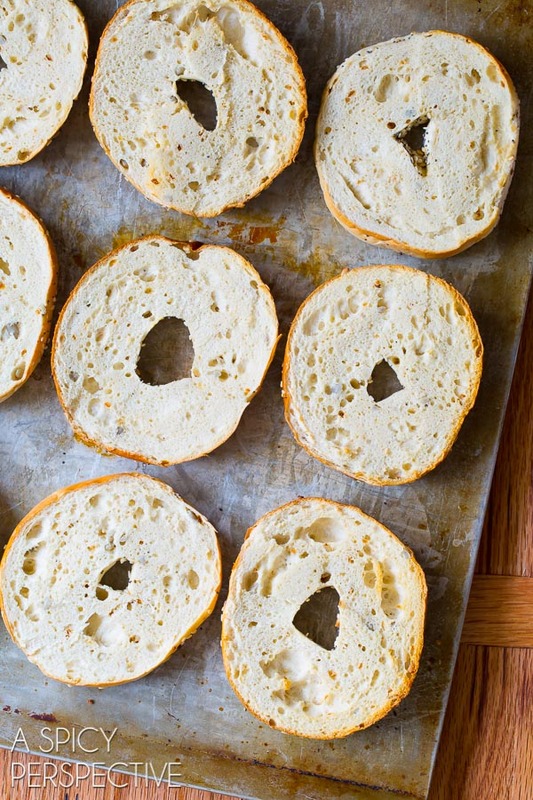 Twist the Thomas’ Everything Bagels to separate the halves, then lay them cut-side-up on baking sheets. Toast in the oven for 5-8 minutes. To Serve: Place the bagel halves on plates. Smear the top of each bagel with herbed cream cheese. Drain the pickles. 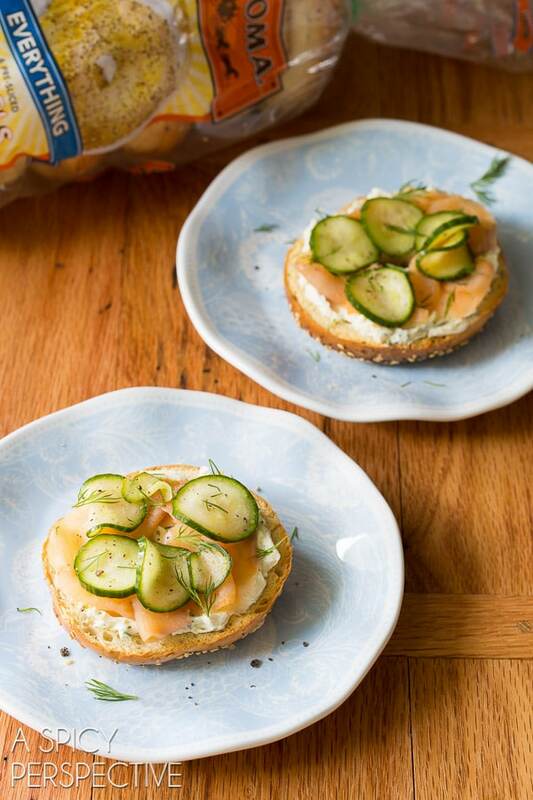 Then layer each bagel with thinly sliced smoked trout and quick pickles. Garnish with extra dill and cracked pepper if desired. Disclosure: This post is sponsored by Thomas’ Breads. All opinions are my own. What is the maximum time you should leave the cucumbers in the pickling juice? Really, you can leave them in as long as you like… Several hours or up to a few days. They just soften with age. However, this particular recipe doesn’t offer enough vinegar for them to stay in the fridge longer than a 2-3 weeks. This is my idea of a perfect brunch recipe! Delicious! Bagel and Lox is my absolute favorite breakfast! I love your trout version. And those Thomas’ Everything Bagels are another favorite of mine! 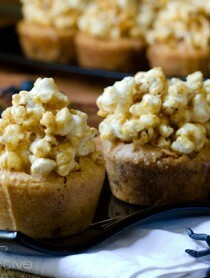 This is such a great-looking snack! We love a good bagel and schmear! Delish!! Looks like a perfect lunch to me!!! Need this for breakfast!! Lovely! We are huge bagel fans here – I am loving this!! 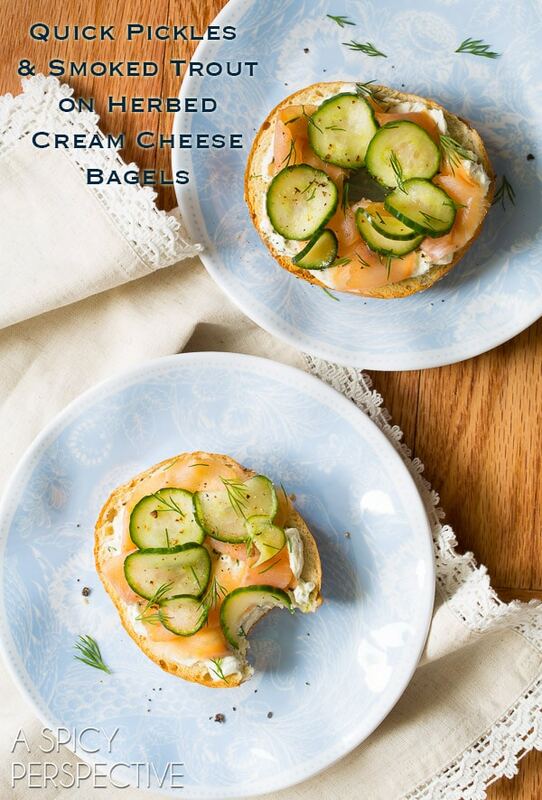 Fish, cream cheese and bagels is SUCH a winning combination that I will totally look past the mouthful of a name, and shove a mouthful of this into my fave! Love the pickle addition! Pinned! 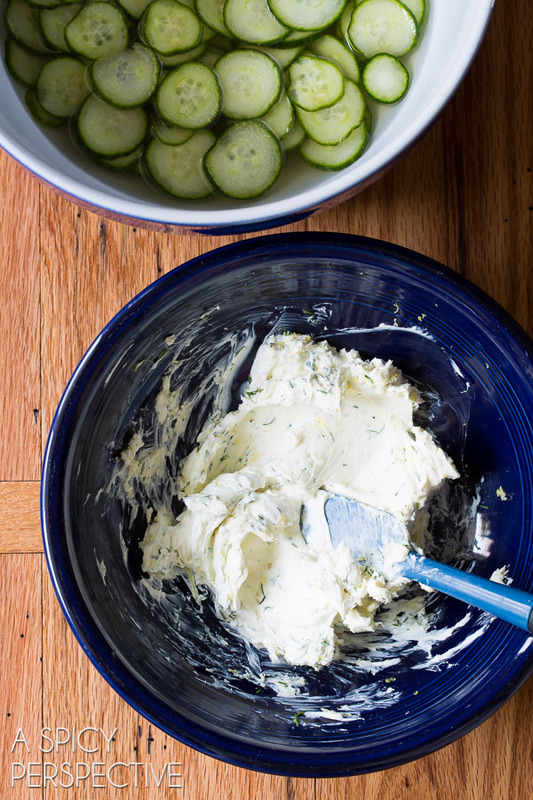 I love that you made your own herbed cream cheese! And those everything bagels – I love Thomas’s everything bagel- perfect ratio of chewy interior and crisp exterior.